The Brotherhood of Eternal Love colored the black flag of anarchy rainbow tutti-frutti. 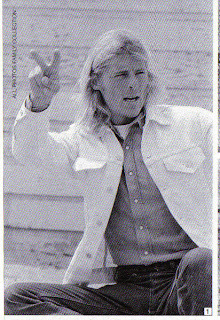 And it may not have considered itself such, but an excellent article in the July 2007 issue of “Surfer" magazine profiling legendary board shaper, wave hunter, film star, movie producer and all-around mad man, Mike Hynson certainly suggests they were. The article was written by Steve Barilotti. It is not available online and we thought a highwayscribery-styled “book report” for the piece (even though it’s not a book) was in order given the great accompanying visuals, and the fact it fits a number of the blog’s themes. 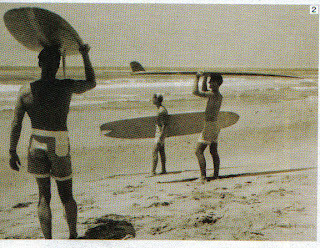 At bottom is Hynson, age 17, working as a shaper for G&S in Downtown San Diego.. A few years later he starred with some other guys in a famed surf film, “The Endless Summer.” the iconic poster for which (Hynson in the middle) is second from the bottom. The rest, as they say, is surfstory. Ah, but the sixties were the sixties good friends. Look at the familiar temporal progression in the photos. Short to long hair, straight to freaky-deeky clothing, and a lifestyle shift to match them is what ensued. 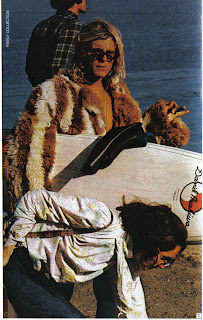 Hynson, contrary to most surf-urges of the day, was a dandy who for a time owned a clothing store in La Jolla stocked completely with goods shipped in from Carnaby Street, when Carnaby Street was, well Carnaby Street. Which clearly (perhaps proudly) he was. Barilotti jumps around a bit in his piece, choosing to lede with Hynson’s involvement as co-producer of a strange film product involving the collaboration of Jimi Hendrix known as “Rainbow Bridge,” which highwayscribery promises to review sometime in the near future. 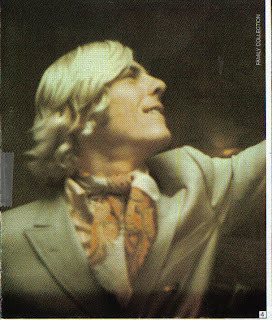 It’s an interesting story about how Hendrix’s death held up the film’s release and how Hynson, seen in the third picture from the bottom during the shoot, and director Chuck Wein, skirted legal issues with Warner Bros., and “four-walled” the film at the South Coast Cinema in Laguna Beach, south O.C. Leary was on then-President Nixon’s infamous “list of enemies” and this article suggests that the cooler, younger, sexier Hynson probably was, too, given his potential for corrupting the minds of a particularly susceptible generation. Anyway, the premiere was a gift to a brother surfer named Johnny Gale; a crazy guy given to splashing tabs of Orange Sunshine acid at local rock audiences and who built a fortune through illegal drug sales before (surprise!) dying violently in car crash that the article suggests had something to do with those same illegal drug sales. It’s easy to look back at those times as completely free and open and wild, somehow innocent and forgiving, but when you look harder you see the universal military draft, an ongoing war that, from a casualty perspective makes Iraq look like a family feud. In that light it becomes clear that those crazy self-destructive pioneers of radical politics and sheer sensuality lived dangerously. Why they did so is for the psychologists to determine. Crazy times. Times in which the daughter of a U.S. Senator, Melinda Merryweather, could act in something like “Rainbow Bridge” and marry the psychedelic surfer/producer. Soon after the film was screened, agents busted into Hynson’s cutting-edge shaping studio, Rainbow, and busted some of the custom boards open with rifle butts in a futile search for Afghani hash. No one ever accused the federal government of committing the original turn of thought. The article gets into the specifics of Hynson’s approach to shaping, the radical nature of his “rails,” which are the side parts of the board. 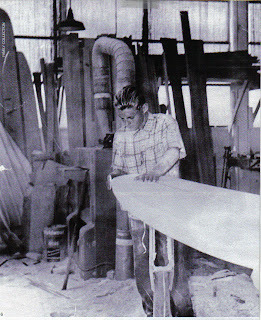 Before Hynson, boards were flat and rounded and sat atop the water. After his innovative, razor sharp edges boards road through tubes and cut the waves up. 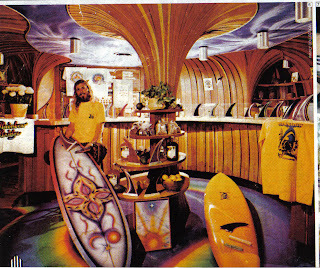 Fourth from the bottom is a photo of the Rainbow Surf and Juice Bar in 1973. It was designed by architect Ken Kellogg and “hand built by Hynson without a single nail or square corner,” according to the article. Hynson’s passion was so abiding that he and a friend, “sweet-talked their way around the Sea World front office to have one of the handlers coax a trained dolphin named Cindy up on the ramp so that Hynson could meticulously trace and duplicate her dorsal fin. That’s enough to know there, although the article gives lots of love to the design aspect, because it is, after all “Surfer” mag. Journalistic requirements obligate the scribe to wind up a story you know too well. The early ’70s, the cocaine, the end of “the dream” and, once again, the dissipation of a streaking, creative spirit. Hynson spent the last 15 years or so sleeping in garages along the San Diego County coast, doing a number of stints in jail and just trying to keep his lonely difficult life afloat. The surf metaphors are actually more refreshing here at highwayscribery than at “Surfer” where the writers work hard concocting original prose for so specialized an interest already burdened with its own linguistic signposts. What saved Hynson, and led to the writing of the piece, was his continued commitment to board shaping, what the article called the endless “quest for forms” ... his craft. Hynson’s shapes are back in demand in the strange and impermeable culture of surf, he’s back on the map and, over sixty, still good with his tools. He has a Web site and the boards are beginning to sell, which makes this fascinating story happier at the endpoint, then it has been for so many of his contemporaries.